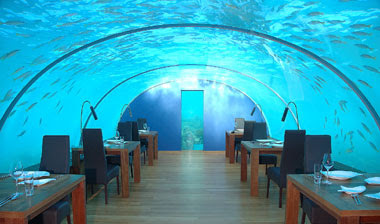 A Thought Shared ....: A Restaurant for the Brave..
Hilton have opened a new restaurant called 'Ithaa'. I know what you are thinking, because the very same thought passed through my mind too. 'Who cares'? Unless it is within easy driving distance, I don't go there, and this one most definitely isn't just down the road from me. It is at the Hilton Maldives Resort & Spa, Rangali Island in the Maldives. Of course, distance is not the only barrier. This is no 'tuxedo and bow tie' establishment or, for that matter, casual dress. This is 'scuba gear and flippers' dress if you ask me. The restaurant is 16 feet below sea level, access gained by a spiral staircase. If you don't kill yourself just getting into it, your waiter or waitress could while trying to get the various courses to you. They say that the menu is typical of high class city 'joints', but that the view will probably take your mind off of the food anyway. Excuse me? It would take more than a few fish and a five star menu to take my mind off looking for leaks. This restaurant is reputed to have cost $5 million, and it only seats 14 at any one time! Somebody should have told them that it would be possible and cheaper to build a 14 seat diner on land, place four underwater cameras in a small glass bubble, and transmit the pictures to large plasma screens affixed to all of the walls.